One of the most popular gifts you can give, a Sorella Name or Message Pendant will always be in style. As pretty as they are personal, these unique pieces are sure to be worn often and treasured always. Choose from a selections of designs, sizes, precious metals and lettering styles. Personalize with your choice of name(s) or a special word or two. Add some extra sparkle with a diamond or birthstone. Add one of our beautiful Necklace Chains to hold your Sorella pendant. 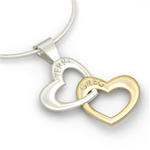 Sorella not only personalizes your Name Pendant, we also make it exactly the way you want it. Do you like things simple and striking? Or would you prefer to add sparkle with a diamond or birthstone? The choice is yours. Select the precious metal you want, as well - platinum, 10k, 14k or 18K gold (yellow, white or rose), palladium or sterling silver. You may even combine them for a unique two-tone design. Together, we will create a beautiful piece of jewelry you won't see anywhere else.